With the chasm of the Burn of Care on one side and that of the Burn of Sorrow on the other, Castle Campbell, originally called Castle Gloom, sounds like something out of a horror movie or a fantasy novel. Yet this is a fascinating castle in a location that is perhaps unmatched for natural splendour anywhere in Scotland, sitting as it does in lofty isolation and overlooked by the Ochil Hills. As the years have gone on, what were once the best views of it from the approach road have become increasingly obscured by tree growth, but it still rates very highly in the "castles we'd like to live in" stakes. 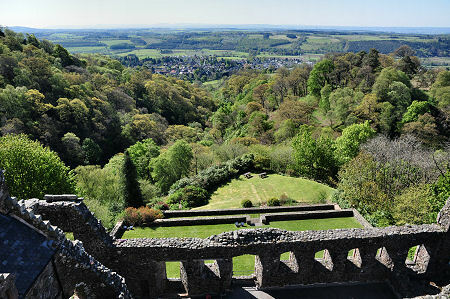 Castle Campbell is located at the head of Dollar Glen, immediately to the north of Dollar. Signposting through the intricate warren of streets at the foot of the glen is fairly good but repays attention. The main car park is signposted off to the side of the access road. Beyond this a very narrow road with marginal passing opportunities continues up a fairly steep hill for 800m or so to a much smaller parking area. From here it is a 500 metres walk, down a steep descent and up to the castle. We are told that the small upper parking area gets congested very easily, and passing other vehicles on the top section of road is difficult, so it is recommended to park in the lower car park and walk. 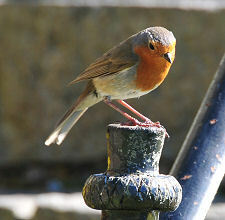 Accessibility information is linked from the visitor information section on this page. Some (but by no means all) of the climbing and descending can be avoided by following a rough path alongside the river up Dollar Glen from the lower car park to the castle. "Castle Gloom" isn't much of a name for a major seat of one of Scotland's most important clan dynasties, so in 1489-90 the name was changed by Act of Parliament, and with the approval of James IV, to Castle Campbell. 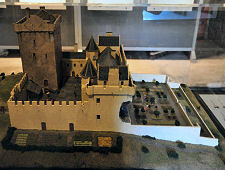 The castle that developed over the following two centuries was designed to serve several main purposes. It needed to be sufficiently defensible to deter casual attackers. This was no fortress, but it still had to protect the family's lives and property when they were living here. More significantly, the castle was intended to be a statement of the family's wealth and power, and as such needed to be an imposing sight. A location within fairly easy reach of the centre of power in Edinburgh was an added bonus. Finally, Castle Campbell had to be a fitting residence for the extensive household of a member of the senior nobility who also had to provide hospitality to guests and their entourages. These included royalty, nobles and others. Mary Queen of Scots stayed here in January 1563 while John Knox, father of the Reformation in Scotland, had done so in 1556. The Campbells would eventually rise to be the most powerful clan in the western Highlands, and occupy important positions in government. 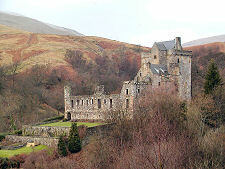 By the 1600s, however, their days at Castle Campbell were numbered. In 1650, Oliver Cromwell defeated the Scots at the Battle of Dunbar and prompted decades of turmoil. The 1st Marquis of Argyll supported Cromwell, and in 1654 the castle was sacked by Scots in retaliation. The family returned to favour, and were awarded an dukedom, in 1688 after the "Glorious Revolution". 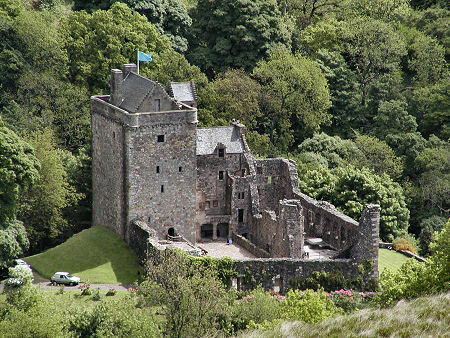 They abandoned Castle Campbell, preferring instead to live in Stirling where they settled in the town house that was to become known as Argyll's Lodging. Today's Castle Campbell is unusually complete. The main buildings are a tower house, a hall and chamber range and an east range. To the south are terraced gardens. 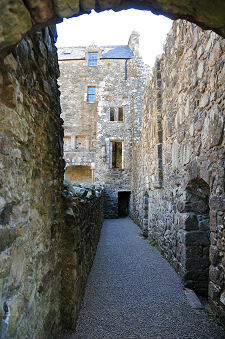 The buildings and outer walls wrap around a cobbled courtyard that gives the castle much of its character. The tower house has four main floors and is typical of a late 1400s style. The ground floor, reached by a short external staircase, contains a vaulted storage cellar with service access. An upper entrance, once reached by a rather longer staircase, leads into the hall, the principal reception room. An original narrow spiral staircase was replaced in about 1600 by a much more substantial one at the same time as the east range was also remodelled. The second and third floors of the tower house were most likely used as private chambers. Of particular interest on the third floor is the stone vaulting to the ceiling and a pair of grotesque green man masks from whose mouths lights would have been suspended. 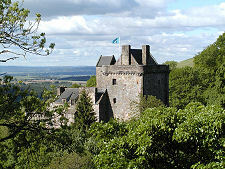 It is likely that the hall and chamber range replaced the tower house as residence for the Earls of Argyll. The reception room and the accommodation at its east end was certainly on a much grander scale. Sadly this part of Castle Campbell is the least well preserved. The east range dates from about 1600 and its facade shows that it was a very sophisticated piece of design. 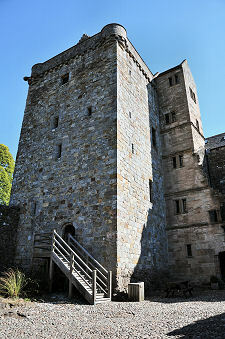 Remodelling of the stairs gave improved access to the tower house as well as interlinking the chambers and floors of the east range. 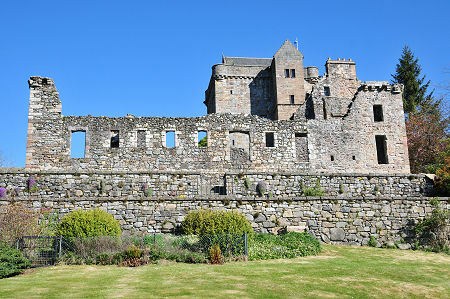 It is likely that the gardens of Castle Campbell were formally laid out and maintained for the exclusive use of the lord, his family and guests. At the south-west corner of the terracing a rocky knoll is referred locally as John Knox's Pulpit because of a local tradition that John Knox preached to a large crowd from here while staying at the castle. You only have to look at the steep drops around it to realise that this is unlikely. To the west of the castle there would have been a kitchen garden.